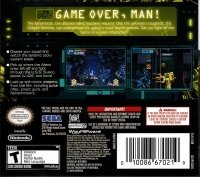 Box Text: GAME OVER, MAN! The Xenomorph, the ultimate killing machine, returns! Only the universe's toughest, the Colonial Marines, can exterminate the galaxy's most feared species. Can you fight off the terror of an alien infestation? Choose your squad and watch the dynamic story adapt. Pick up where the Aliens crew left off and fight through the U.S.S Sulaco, planet LV-426, and more! Load up with iconic weapons from the film, including pulse rifles, smart guns, and flamethrowers. 08-13-2014 mark1982 Box Text GAME OVER, MAN! The Xenomorph, the ultimate killing machine, returns! Only the universe's toughest, the Colonial Marines, can exterminate the galaxy's most feared species. Can you fight off the terror of an alien infestation? Choose your squad and watch the dynamic story adapt. Pick up where the Aliens crew left off and fight through the U.S.S Sulaco, planet LV-426, and more! Load up with iconic weapons from the film, including pulse rifles, smart guns, and flamethrowers. 03-22-2012 scott Box Text GAME OVER, MAN! The Xenomorph, the ultimate killing machine, returns! Only the universe's toughest, the Colonial Marines, can exterminate the galaxy's most feared species. Can you fight off the terror of an alien infestation? Choose your squad and watch the dynamic story adapt. Pick up where the Aliens crew left off and fight through the U.S.S Sulaco, planet LV-426, and more! Load up with iconic weapons from the film, including pulse rifles, smart guns, and flamethrowers. 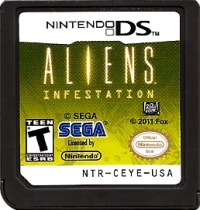 This is a list of VGCollect users who have Aliens: Infestation in their Collection. This is a list of VGCollect users who have Aliens: Infestation in their Sell List. 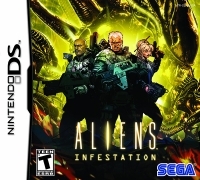 This is a list of VGCollect users who have Aliens: Infestation in their Wish List.